View our platinum engagement rings here. Gold used to be the standard for judging the value of an engagement ring, but that’s all changed. Platinum engagement rings are more in demand than ever before. Platinum’s popularity is evident everywhere. Its scarcity and beauty has made it somewhat of a status symbol. Recording artists often brag about platinum in songs and pose for photos wearing large platinum rings and necklaces. Credit card companies now offer platinum credit cards, which are a step above gold cards. Gold has finally been displaced as the most precious of precious metals. The demand for platinum engagement rings is so high that the value of the metal has reached all time highs. It’s true that platinum engagement rings are more expensive than those made of gold but the benefits justify the price. Why are platinum engagement rings more expensive than gold rings? Platinum is a precious metal. In fact, it’s more precious than gold. It takes ten tons of platinum ore to produce one ounce of pure platinum. It also weighs more than gold, so the added weight makes for a more expensive product. Platinum engagement rings are considerably more expensive than gold engagement rings. Producing quality platinum engagement rings takes a lot of work. Because of the density of platinum, only a highly-skilled worker can create a worthy product. What benefits do platinum engagement rings offer? Platinum engagement rings are rare, and having one shows just how much consideration you put into your purchase. Platinum engagement rings are extremely beautiful. The look of a platinum ring is clean, stylish, and sophisticated. It’s a perfect compliment to any type of precious stone, especially a solitaire ring. The platinum look is similar to that of white gold but it has the added benefit of being hypoallergenic. So, if you want the white gold look but have overly sensitive skin then a platinum ring will meet your needs. Most white gold rings need a protective coating to keep the white gold color. Not so for platinum. It may not look as bright or shiny as a white gold diamond ring, but it will not need to be rhodium plated to keep its color. To learn more about our collection of platinum engagement rings, feel free to drop us a line. We’ll be glad to provide our expertise. 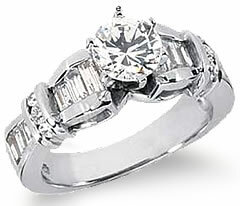 Platinum engagement rings outlast most other precious metals. If you have a ring with both gold and platinum elements, you’ll notice the platinum area lasts longer. The strength and reliability is one reason why platinum costs more than gold. Platinum engagement rings are serious financial investments and like any worthwhile investment, they pay for themselves over time. Of course, platinum engagement rings require occasional care but you can rest assured your ring will be in excellent condition for years to come. We hope you found this article informative. Together we can find the right engagement ring for your style and budget. If you want to know more about platinum engagement rings, we’ll be glad to speak with you. Or, if you prefer another type of metal, we can help with that as well. Being engaged should be enjoyable and so should shopping for your engagement ring.